At the end of Mark 2:16, there is a textual contest: do the scribes and Pharisees ask why Jesus eats with tax collectors and sinners, or do they ask why Jesus eats and drinks with tax collectors and sinners? The Greek manuscript support for the non-inclusion of “and drinks” is rather thin: B, D, and W (that is, Codex Vaticanus, Codex Bezae, and Codex Washingtonianus). They are joined by six Old Latin copies. That, at least, is all the support listed in the textual apparatus of the fourth edition of the UBS Greek New Testament, once one removes the forgery 2427 (“Archaic Mark”) from the picture. Metzger laid the spin on pretty thick in his Textual Commentary, claiming that the shorter reading was thus “strongly supported.” This is quite an exaggeration, inasmuch as there is only one non-Western witness in the bunch. Meanwhile, the external support for the inclusion of “and drinks” is massive: it includes not only the hundreds of manuscripts stacked up behind the apparatus’ reference to the Byzantine Text, but also Papyrus 88 (from the 300’s), Codex A, family 1, 33, 157, 892, three Old Latin copies, the Peshitta, the Gothic version, and one Sahidic manuscript. The Armenian and Georgian versions also include a reference to drinking. This array of witnesses is widespread, both geographically and in terms of textual groups. affinities in this part of Mark. But what about the text-critical axiom lectio brevior potior – the shorter reading is to be favored? That is simply not a well-grounded premise, and the damage that it has done needs to be undone. As Juan Hernández Jr. has acknowledged, “The pioneering studies of Colwell and Royse on the papyri demonstrated that the general tendency during the earliest period of textual transmission was to omit.” The Alexandrian text should thus be compared to a ship which reaches its port lighter than when it embarked because the weight of the barnacles that attached themselves to the hull during the voyage was less than the weight of things that the crewmen dropped overboard. It may seem reasonable to suppose that copyists operated on the principle of “When in doubt, don’t leave it out,” but that idea is not observationally grounded. Furthermore, even when Griesbach advocated a preference for the shorter reading over 200 years ago, he included a qualification which is relevant to the contest in Mark 2:16: we should prefer the fuller reading before the shorter (unless the latter is seen in many notable witnesses) if homoioteleuton [that is, the occurrence of words or phrases with similar endings, in close proximity to one another] might have provided an opportunity for an omission. Here is the Byzantine text at the end of Mark 2:16 and the beginning of 2:17: . . . Τί ὅτι μετὰ τῶν τελωνῶν καὶ ἁμαρτωλῶν ἐσθίει καὶ πίνει; Καὶ ἀκούσας ὁ Ἰησους λέγει αὐτοῖς . . . .
Notice the homoioteleuton: the letters ει καὶ occur near the end of verse 16 and again at the beginning of verse 17. No theory of a semi-harmonization to the parallel-passage in Luke is needed to account for the difference between the Byzantine reading and the reading in Codex Vaticanus; the simple explanation is that a copyist in the transmission-line of B’s text accidentally skipped from the first occurrence of -ει καὶ to the second occurrence of -ει καὶ. Thus, in this case, the shorter reading is explained by the longer reading. Harmonization did occur in this verse in some manuscripts. 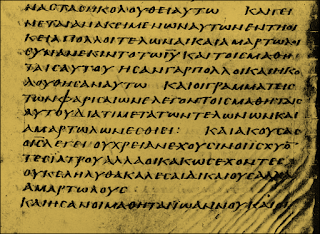 In Codex Sinaiticus, the end of Mark 2:16 is conformed to Matthew 9:11, so as to rephrase the question not as “Why does He eat with tax collectors and sinners” but instead as “Why does your Teacher eat with tax collectors and sinners.” Thus we observe not just one, but two mechanisms by which the reference to drinking could be lost: accidental parablepsis, and deliberate harmonization to the parallel in Matthew. 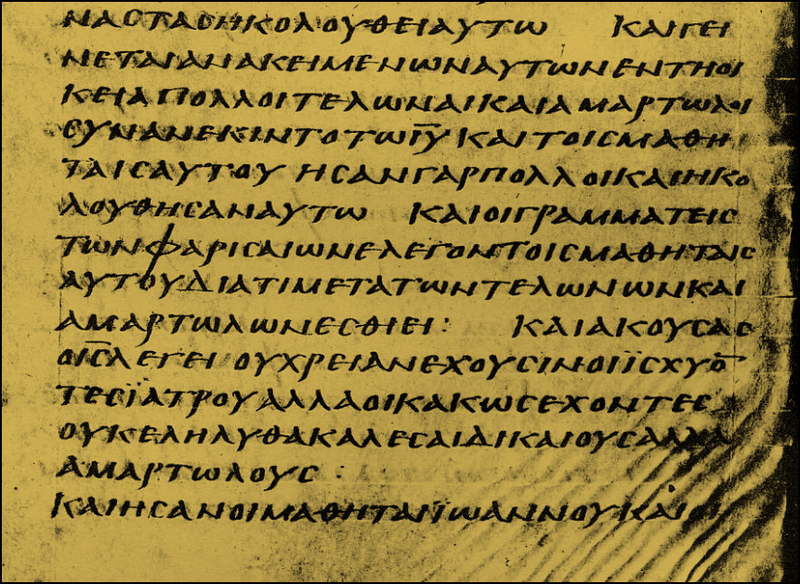 In over 70 manuscripts (including Codices C, L, and Δ) the reference to “your Teacher” has been inserted from Matthew – but the reference to drinking has not been removed; nor was the Greek text adjusted to match the words in Luke 5:30. Either the copyists who created this reading were simultaneously harmonizing and unharmonizing – making the text resemble Matthew 9:11, and then making it different – or else the reference to drinking was there to begin with in their exemplars. Their Alexandrian exemplars. What about the parallel in Luke 5:30? 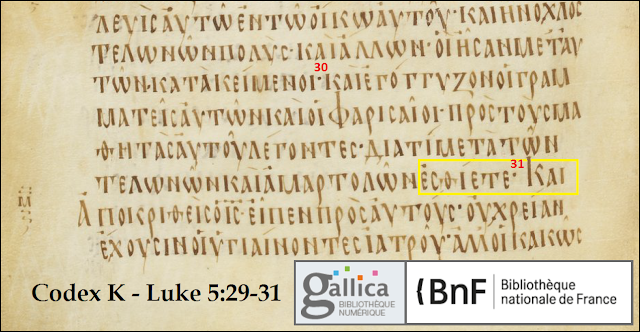 If Byzantine copyists had wished to conform the words at the end of Mark 2:16 to the parallel in Luke 5:30, the natural way to do so would be to write ἐσθίετε καὶ πίνετε – for those are the words in Luke 5:30. This was indeed done in a relatively small number of manuscripts (including, notably, Codex Σ and minuscules 565, 700, and 1241), but it is not the Byzantine reading. In addition, if harmonization is to be suspected, then one may observe that it was not necessary for copyists to interrupt their copying and consult the parallel-passages in Matthew and Luke in order to have a basis on which to make a textual adjustment. A basis for conformation-via-shortening is built into Mark 2:16, inasmuch as the beginning of the verse mentions Jesus eating, but not drinking. In conclusion: the reading with καὶ πίνει explains its rivals. What we have here is a simple case of the loss of two words due to homoioteleuton. This loss probably occurred in the Western Text, and then influenced the text of a single Alexandrian manuscript (Codex Vaticanus). (d) attested in a papyrus (P88, from the 300’s). With this internal and external evidence pointing in favor of the inclusion of καὶ πίνει in Mark 2:16, it is tempting to suspect the survival of the shorter reading in Mark 2:16 in modern compilations (including the new Tyndale House edition of the Greek New Testament) is due to two factors: an overestimation of Codex Vaticanus’ resistance to Western readings, and an unscientific reluctance to acknowledge Byzantine readings as original. Finally, a couple of small details noted by Wieland Willker may add something to the case; he mentioned that in Codex K, in Luke 5:30, the words καὶ πίνετε are absent. This illustrates the same mechanism which caused the loss of the words καὶ πίνει in Mark 2:16; the only difference is that the homoioteleuton in Luke 5:30-31 involves different letters (-ετε καὶ). He also mentioned that seven medieval Byzantine manuscripts lack καὶ πίνει in Mark 2:16. Here one of the canons of equitable eclecticism may be effectively applied: If a variant occurs sporadically in witnesses greatly separated by age and textual character, this may indicate that the variant was liable to be spontaneously created by copyists, rather than that it was transmitted by distant transmission-streams. © 1971 by the United Bible Societies, Stuttgart, Germany. "If a variant occurs sporadically in witnesses greatly separated by age and textual character, this may indicate that the variant was liable to be spontaneously created by copyists, rather than that it was transmitted by distant transmission-streams." Although I am not very interested in other religions, this one truly caught my eye. The data and information about the Bible and codex presented therein is wonderful. Everyone should look at this.